These instruments increase lab productivity and save valuable technician time by simultaneously conditioning two slurry samples for subsequent testing. These instruments are simple to operate with all of the controls conveniently located on the front panel. The unit is designed so that closure, heating and pressurization can be achieved quickly. The slurry cup drive automatically rotates the cup at the required, standard rate of 150 rpm. Accurate temperature control of the stainless steel water bath is maintained by a programmable temperature controller as well as a motor-driven stirring mechanism in the water bath that eliminates hot spots on the slurry cups. Indicators for each viscosity and the water bath temperature are readily visible on the front panel of the unit. 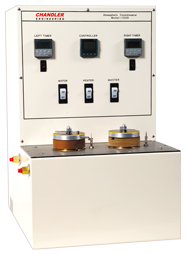 The Model 1250 adds a strip chart recorder which provides a permanent record of temperature and viscosity measurements. Upon completion of slurry conditioning, cooling coils can be used to quickly lower the temperature of the slurry for safer handling.